..And i can say that i am hooked! The book is build in a funny way. In the start of the book the author writes a little note about how he wrote it all down from a recording by two kids. Through the book it switches between the two main characters - Sadie and Carter - who i telling the story and who is coming with small comments in between. It's literally a fight between siblings throughout the book. 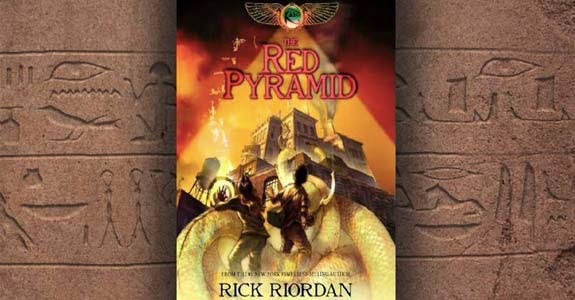 The reason i pick it up, was because i just finished the first book about Percy Jackson and loved how Rick Riordan wrote. On top of that i can't get enough of mythologies. Percy Jackson is about Greek Mythology and that's all cool and stuff, but when i found out that the same guy wrote a series about Egpyt Mythology i just knew i would love the book. One thing i have to admit - there is a lot of diffrent gods and goddesses to keep an eye on. Now that i already knew a lot about Egypt Mythology it was quite easy for me. But i think you will come to a point in the book where you have to google something or simply look in the back of the book where the author has made a little lidt of all the gods, goddesses, creatures and in short form tell what they do. The story is very much unlike many others. I tried the whole time to figure out what whould happend next, but the story takes so many turnes very quick that you often sit with a "What just happend? "- feeling. In a good way! I gave it 5 out of 5 on Goodreads!